MOSCOW, June 9. /TASS/. The situation in Syria significantly improved after the signing of the Astana memorandum on setting up de-escalation zones, Head of the Main Operations Department at Russia’s General Staff, Lieutenant-General Sergei Rudskoi told reporters on Friday. "The situation significantly improved after the Astana memorandum on setting up de-escalation zones was signed on May 4," he said. 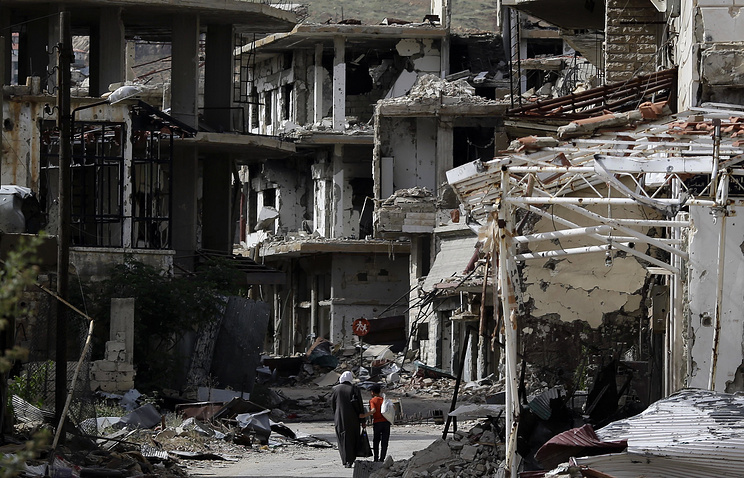 "In fact, the civil war in Syria has stopped," the general added. According to him, the memorandum created conditions to launch the work aimed at restoring the destroyed settlements which were not occupied by terror groups. "Schools are being renovated so that children could resume their studies. In just one month, international organizations sent a total of 14 humanitarian convoys, which made life much easier for the locals," the Russian general said. Rudskoi added that after the al-Wafideen humanitarian corridor had been set up with the assistance of the Russian Center for Reconciliation of the opposing sides, humanitarian aid from the United Nations and the International Federation of Red Cross and Red Crescent Societies started to arrive in Eastern Ghouta. "This made staple foods prices decrease by 30-60%," the general noted. He said that ceasefire agreements had been signed with representatives of 1,571 settlements. Besides, 219 armed opposition units have also joined the ceasefire. More than 6,800 militants and members of their families have left Damascus via the humanitarian corridors, Rudskoi said. 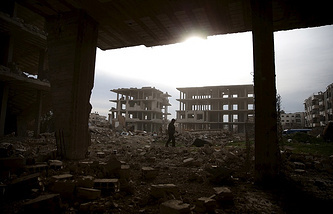 "To prevent civilian casualties, an operation was conducted to take militants and members of their families out of the suburbs of Damascus and Homs. It was held with the participation of officers from the Russian Center for reconciliation of the warring parties. "During this operation, 1,853 militants and 5,012 members of their families were transported from the Syrian capital city’s suburbs of Barza and Qaboun to the Idlib province," he said. According to Rudskoi, the buildings abandoned by militants are checked by sappers for explosive objects. Critical infrastructure facilities are restored simultaneously. "Residents of these areas are returning to peaceful life," he said. Almost 100 Syrian sappers have undergone training in Russia’s International Mine Action Center in Aleppo, according to Rudskoi. "Ninety-two Syrian sappers were sent to conduct mine clearance effort in Maskanah and other settlements in the eastern areas of the Aleppo and Homs provinces, which have been recently liberated from Jihadists," Rudskoy said. The Syrian sappers are involved in demining areas freed from militants.